How long can meat be safely frozen? What is freezer burn and how do I avoid it? How do I safe thaw meat? I'll discuss these questions and more in this article on freezing meats. Frozen meats can be safely frozen indefinitely as long as your freezer maintains a temperature of 0°F or lower. At this temperature, bacteria, yeasts, and molds are inactive (not destroyed). Freezing meat simply stops the clock when microbes are concerned. So, if a piece of meat is about to go bad when you freeze it, it's about to go bad when after you thaw it. It's best to freeze fresh meat shortly after purchase unless you plan on using it. Enzymes are not stopped by freezing, but merely slowed down, so the quality of the food may diminish over time. This is not a safety issue, but a food quality conern. An avoidable quality detractor is freezer burn. Freezer burn occurs when air comes in contact with the surface of the food. Frozen water on the surface or just under the surface sublimates (like evaporation except going from solid directly to vapor) into the air. (This is the same reason why ice cubes slowly "disappear" in the freezer.) This causes moisture to be lost from the meat over time resulting in discoloration and a dry, leathery texture. The meat is still safe to eat, but the freezer burned sections won't taste good. Simply cut the affected portions off before or after cooking. The risk of freezer burn can be minimized by good packaging. Although you can safely freeze meat in the packaging provided by the market, the plastic used are usually air permeable. Repacking the meat so that as little air as possible comes into direct contact with the food will reduce the chances of freezer burn. Some effective solutions are to pack the meat in liquid (like chicken parts in broth), vacuum sealing, wrapping in heavy-duty aluminum foil, or using a plastic freezer bag. 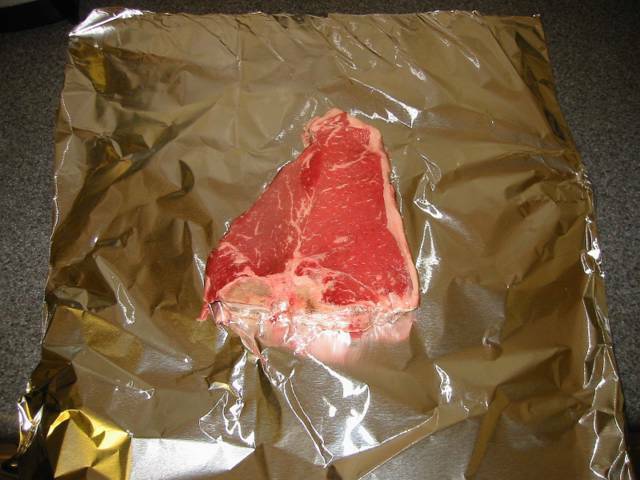 First I place the a portion of meat onto a large piece of heavy-duty aluminum foil. Fold two sides over so they meet in the center. 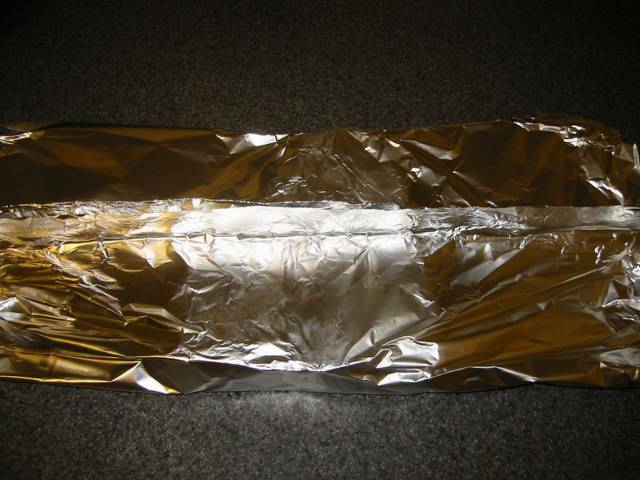 Take the overlapping foil and fold in half to form a seal that runs along the package. Fold again in half in the same direction to form a double seal. Flatten the open ends to form two flaps. If the flaps are long enough to overlap, fold them over the meat and fold the overlap in half to form a seal. Fold again to form a double seal (as shown below). If the flaps are not long enough to overlap, simply fold each flap in half and once again to seal the ends. The foil should fit tightly against the meat. 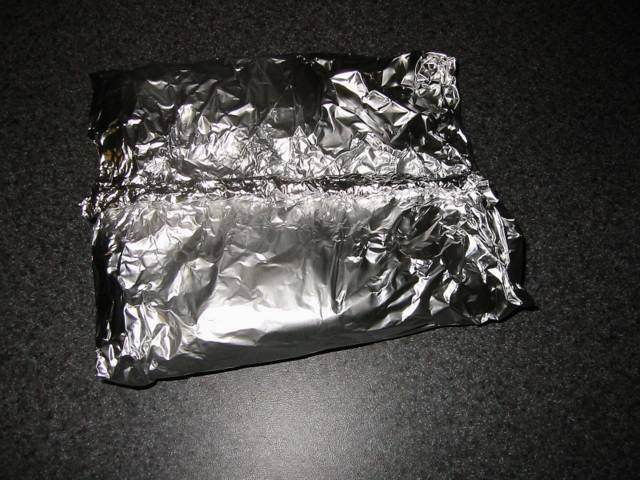 After all the meat has been wrapped, label a plastic freezer bag and place foil wrapped meat inside. Squeeze as much air as possible out of the bag and seal. Plastic bags that are not rated for freezing may be gas permeable and may result in freezer burn if frozen for longer than two months. Wrapping the meat in aluminum foil first keeps portions separate, seals each piece of meat, and allows me to selectively thaw or refreeze portions. When freezing meat in liquid (for example, chicken pieces in broth), I just place the meat and liquid in a freezer bag and make sure that the meat is either in direct contact to the bag or covered by the liquid during freezing. There are a few safe methods of thawing meat, but only one way that allows you to refreeze the meat if you don't use it. Thawed meat inside the refrigerator is safe to be refrozen as long as the refrigerator maintains a temperature of 40°F or less. 1. Refrigerator - Takes a long time to thaw (one or two days for modest sized meats, 5 hours per pound for large meats like whole chicken or turkey). Results in an even thaw (same temperature throughout once it is done). Can be frozen after thawing. 2. Cold Water Bath - Place the meat in a leak proof bag and submerge in cold water until defrosted. Change the water every 30 minutes to an hour for the duration of the thaw. Cook the meat immediately. Do not refreeze. 3. Microwave Oven - Follow the directions provided with your microwave oven when defrosting. Meat usually comes out unevenly defrosted, so some parts may be warm (a prime breeding ground for microbes). Cook immediately. Do not refreeze. Great read.... this topic seems to have many old time wive's tales though. I recently saw a Chef from TBS "Dinner and a Movie" segment that made a point of saying meat in the freezer is not in suspended animation, but instead in a state of slow degradation. I recently got an inexpensive aluminum grill/griddle (the kind that spans two burners on a stove), and was interested to see that it was also advertised as a great thawing device. Indeed, a couple of weeks ago we thawed some rock-hard frozen swordfish on the thing in under an hour. I guess the conductive properties of the griddle radiate away cold very effectively. Old wives' tales? The United States Department of Agriculture states "Food stored constantly at 0°F will always be safe. Only the quality suffers with lengthy freezer storage. Freezing keeps food safe by slowing the movement of molecules, causing microbes to enter a dormant stage." Are you going to trust a chef on TV or an engineer who is obsessed with reading about cooking (or the government)? Hmmm, come to think of it, none of those are comforting sources of information. If you're concerned, then eat your frozen meats within six months - chances are the quality will be better anyway. That sounds like a great tip! I'll have to try it with my aluminum griddle or an aluminum pot. Did you thaw in the refrigerator? As a bachelor that is both thrifty and enjoys the better things in life, yes it's possible, I have developed many ways to buy in bulk and eat well. One of which involves purchasing larger packages of skinless boneless chicken breast, and performing a combination seasoning / marinade while frozen. I too was at first a skeptic, but have found this to be an excellent way to not only preserve food but add delicious flavor as well. What I do is "clean up" the breast by cutting all remaning traces of fat and excess skin left by the packing plant. Then I puncture the breast lightly a few times with a common fork and season well with common spices and/or s&p. I then use one individual freezer safe ziplock bag, good quality bags work best I've found, per breast with a liberal amount of a good marindate. I usually create roughly 5 or 6 of these of various flavors and freeze them all. Waaalaaa, one grill mate for a party of one. Simply take a single bag out of the freezer on the way to work in the morning and place in the kitchen sink. When you get home you are ready to go for dinner. I'm not sure what the freezing action does, if anything, but they seem to be much juicer and hold the marinade much better when frozen together. How about a cattle rancher and computer scientist? 1) Buy yourself a deep freeze unit. Your refrigerator's freezer unit is not intended for storing food for long periods of time (think defrosting). 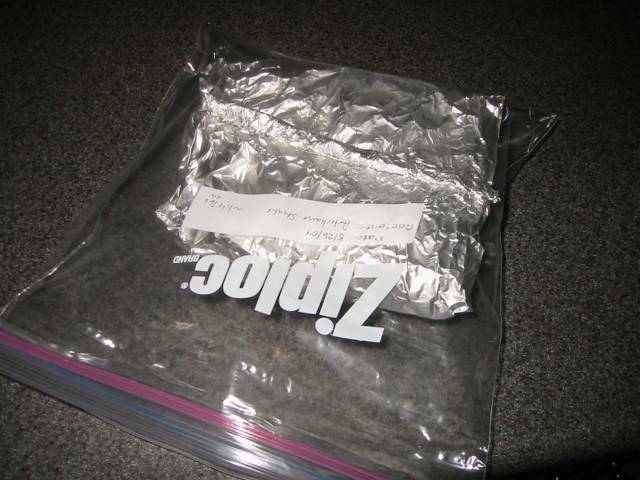 2) The tinfoil/ziploc method may work (I've never tried it). Personally, I use either butcher paper (available in big rolls, on the cheap) or a vacuum unit (FoodSavers are good and cheap at Costco and Amazon). Also, do yourself a favor and save money by buying large cuts of meat, cutting them into steaks, and freezing them. You'd be surprised at how much cheaper it is to go buy a large cut at Costco or a butcher than it is to get lots of individual steaks at your grocer. You may also be able to save money by buying beef by the box (ask for boxed beef at your butcher shop [or Costco]). I'm curious as to how effective it is to store fish (perhaps other meats also) for long duration in solid blocks of ice. I had friends years ago in Montana who stored freshly caught trout in milk cartons filled with water. They swore by it and I did eat some that was over a year old that tasted quite excellent. It was a large commercial freezer that did provide low temp. Also the thaw time was not exactly quick, but I'm picky about my fish and this did seem to work well. This isn't specific to alumnium, it's a conductivity thing. You'll do even better with a cast iron pan immersed in another cast-iron pan. It's a matter of a) good thermal contact and b) low specific heat on the part of the thawing device. This is why air is such a terrible thawer: it conducts heat poorly and holds onto it fairly well. The phone rang at the Butterball (turkey) customer support line. The person calling in asked, "How long will a turkey stay good frozen?" The help desk worker inquired how long that the person had had the turkey and was informed seventeen years. Well that is a long time and they had to ask some experts. Eventually the help desk worker said that they were finally able to conclude that if the turkey had been frozen at such and such a temperature the whole time it would be safe to eat but the flavor would probablly be off. The caller replied, "Thanky you so much, you have really helped me make my decision. We will donate this one to the church." I thaw meat quickly on the metal surface of my kitchen stove. "Simply take a single bag out of the freezer on the way to work in the morning and place in the kitchen sink. When you get home you are ready to go for dinner." Funny but I've been told this is a spectacularly good way of getting very sick. Your mileage may vary. "Funny but I've been told this is a spectacularly good way of getting very sick. Your mileage may vary." I don't think he was suggesting that you just eat the raw thawed bird. I think it was implied that you cook it when you get back. "I don't think he was suggesting that you just eat the raw thawed bird. I think it was implied that you cook it when you get back." Since the chicken has probably finished thawing long before it's cooked, it better be cooked extremely thoroughly to ensure that all the potential samonella colonies have been completely destroyed. I wouldn't recommend one this thawing method - bring it down to fridge a day or two earlier. -A cooking & language geek.